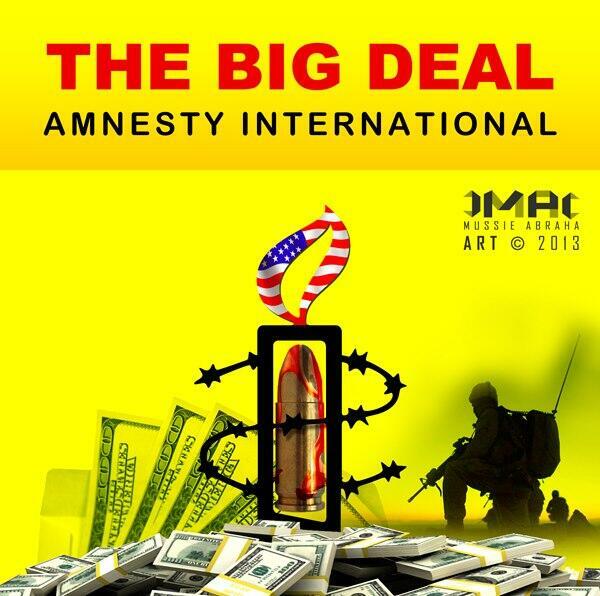 It has been a while since the international community has been assaulted by the criminal entity Amnesty International (AI) using human rights as excuse to demonize nations and leaders of specific nations targeted for destabilization in pursuit of US and Western hegemony. The reality however, Amnesty International has taken the amnesty out of humanity and became a killing tool by using criminals they call dissidents, political opposition and human rights activists to do their dirty jobs of terrorizing people, religious and national institutions in countries of interest. Oddly, the spokespersons that AI, Human Rights Watch and other Western pseudo-rights groups assign to speak on behalf of Africans are almost always Caucasian, with absolutely no connection to the countries they speak against on human rights matters. Not much is required from these players that are misleading Americans and the world about the issues they research and present. And there are no regulations or laws that govern their activities. For the most part, all they do is establish expertise in the area of interest by researching these countries based on safety of their homes from schools and universities of the West. And when they go to other countries for research, it is normally a Western puppet country that they use to buttress their credentials. Then, all their work is considered credible and solid. Furthermore, when the so called researchers or employees of AI, HRW, Reporters Without Borders and ilk present their report, it gets special attention from the “mainstream” media. Then that becomes a cycle of, CNN said that, CNN in turn will quote Human Rights Watch echoing the lies million fold with no mechanism for verification or ways to address the libel when their action warrants lawsuit. And the cycle repeats itself all over. This is a hoax the international community is subjected to. The problem is amplified when these accused countries and subjects have no mechanism or media-outlet they can utilize to fight the heavy handed PR abuse of the West. In a sense, this is what African Slaves were subjected to. This destabilization methodology is costing the people of Africa millions of lives and lasting destructions that will leave a legacy far worse than that of slavery because identities and institutions of these countries are decimated in pursuit of resources they possess. Recently, such agent, a “researcher” of Amnesty International Claire Beston, with no connection to Eritrea, made damming accusations and lambasted Eritrea based on hearsay, innuendos and fabrications. The human rights violations she accused Eritrea about is so outlandish that it makes Eritreans wonder if she is talking about the same Eritrea everyone contributed to free from shackles the West placed-it under. Eritrea, a country that millions of Eritreans visit year around, a country they love so much, a country they love more than their lives, a country they gave their life for and ready to do again. It must not be the Eritrea they know. Note: the report is by AI and posted by Huffington Post via AFP. On the bottom of the article there is a picture of President Isaias on a podium while on a state visit in one African country receiving a presidential salute by soldiers of that country. Eritreans and the people of Africa know that the soldiers on the background are not Eritrean. But the West has no clue. Hence, they placed the picture to dupe the West into making them think that this is just another African dictator that uses the military to suppress the people. Moreover, the report, when presented as if from a third source in this case AFP, it gives the impression of multiple sources reporting on the story and thus, attempt mold a perception. What a lie. The reality is President Isaias is so much a product of the people, a president who lives amongst the average Eritrean not in a Presidential Palace and very hard to photograph in the manner Huffington Post presented, picture synonymous with African dictators. That is not the makeup of the people of Eritrea or the makeup of the leaders of Eritrea. The people of Eritrea are civilized, far too sophisticated to be placed on the narrative of other African countries that have been robbed of their ability to lead their destiny. Eritreans have mastered their destiny and there is nothing Claire Beston or anyone else can do about. The whole idea behind these types of incendiary reports is to provoke action using few of their agents. The West is also the primary audience since the West is the determinant-power that can determine the future of these insignificant Eritreans? In line with that strategy, recently, a group of people (claiming to be Eritrean) have been making robocalls to Eritrea from the US and other Western countries trying to entice Eritreans to revolt. This is where the hypocrisy of the West is evident. The FCC regulates robocalls in the US. Furthermore, one could imagine what would happen if another country allows robocalls designed to entice revolt in the US reach American homes. The US will declare war on the nation where the calls emanated from. However, in the US, the groups, or individuals responsible for these unregulated and uncontrolled criminal calls are hailed as heroes by NPR’s Gregory Warner. Recently, NPR’s Gregory Warner presented unbalanced interview and introduced the criminal robocallers as heroes to unassuming American. He also made outlandish remarks regarding Eritrea. The reality, however, Amnesty International, Human Rights Watch and others were mum when the people of Eritrea were mangled by napalm bombs, imprisoned in palaces of the city of Asmara and all over Eritrea. In the 1980’s, when Augosto Pinochet’s reign terrorized the people of Chile, a powerful song by Sting called, “They Dance Alone” depicted the realty of the mothers in Chile vividly. Then as in now, celebrities lined up supporting Amnesty International’s efforts for human rights believing that AI is fighting for the rights of people worldwide. When Chile, received the global attention, Eritreans worked very hard to grab the attention of the world, to find help and solutions for the plight of the people of Eritrea. They wrote to musicians such as Sting, Bono and others. They wrote to Amnesty International to speak about the plight of the people of Eritrea. They wrote to tell the world that they too have mothers that danced alone. But no Western organization or individual came to the aid of Eritrean mothers. Thence, why is AI interested to save Eritrea from the very people that brought independence during the month that Eritrea celebrates independence? Is there any Eritrean who thinks that the immature rants of junior Western journalist going to bring justice for Eritrea? Have they brought justice anywhere? The West keeps undermining the people of Eritrea. The West wants to believe their lies and deceitful practices that proved effective everywhere will also prove to be effective against Eritrea. Not quite. Eritrea will thrive and celebrate 22 years of independence gloriously all around the world. Eritrea will get together, dance, enjoy one another and embrace Independence Day. And there is nothing any one can do to dampen the spirit. Eritreans are far too smart to be duped by immature liars that anoint themselves as journalists. That is because Eritreans know what and how they paid to gain the precious gift of independence.